If there is any horrifying story in Rubanda is the sick water and its scarcity. Rubanda has a hilly landscape which means one finds households scattered all over in the valleys as well as on top and on the hilly slopes. Like a duty ordained, its mostly mothers and children who spend daily long hours tracking for drinking water. Its incredible. However, Rubanda Solidarity Nursery/Primary School is working hard to make a difference by applying a manageable technique of water harvesting in spite of its meager finances. It's the organization's priority and mission to improve the life situation of which provision of healthy water is just one ingredient of basic needs for our kids. But its a slow process due to limited resources. Development shock for kids: Children at Rubanda Solidarity School like in their home are forced to pick up their little containers(jerrycans) every early morning and first rush to the well to fetch water before they can enter their class . Otherwise they would not have their meal when out of class. Kids spend most of their childhood tracking for water. 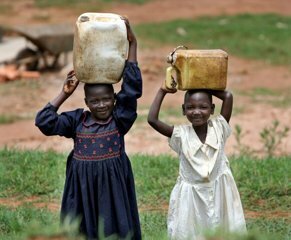 Other times, children spend a day or so without drinking water because it's not available or is too sick that the child can't withstand it.Water that is described as "life" is precious even before its claimed "safe" in Rubanda. Many times we see the situation and just close our eyes. To see people literary searching and scrambling for drinking water as in a hunting game is absurd and is pushed to question why such suffering. Women and children bear the harsh situation finding safe and drinking water. Many times they wake up in the middle of the night only to walk and converge at the only well in the village. This may take them hours to get their containers filled depending on the size of the line and the pressure of the dripping water. Its a drama of water. We always educate our kids that water is life and if you have safe drinking water you have a health stomach and a healthy mind. Our struggle is how to improve the quality of life for our kids by providing them with access to safe drinking water. To know more about life without safe drinking water in Rubanda please just post a comment to Rubanda Solidarity through the space provided below and soon we will connect you. "Life is like a Flower"